When we heard about Kurt van Zyl and Ed Klamp opening a new pinball location in Orlando back in May, we were counting down the days until our planned visit to the city in October. 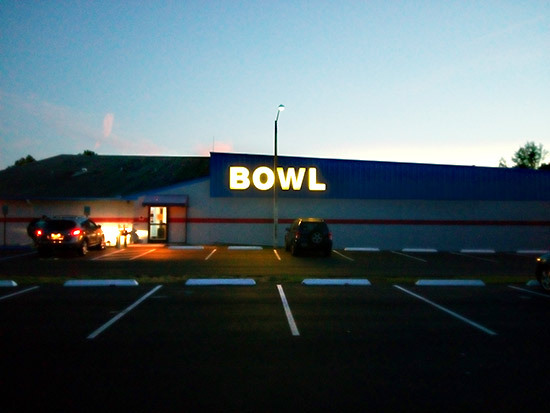 Skip forward five months, and here we are standing in the twilight outside the Oviedo Bowling Center inside which The Pinball Lounge is located. 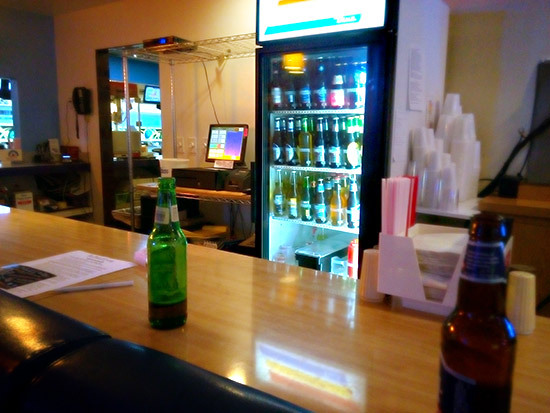 Walk past the numerous bowling lanes and turn left into the bar area, and there's no doubt you are in the right place. Fourteen pinball machines greet you, divided into two banks of seven. The machines here range from an electromechanical Nip-It through to the latest Stern Kiss Pro. Pricing was generally $0.50 or $0.75 per play, but ranged from $0.25 for the oldies to $1.00 for the newest machines. Quarters are accepted on all machines, with dollar bill acceptors on some of the newer ones. There's a change machine too, so all the angles are covered. The machines all looked great and nearly all played well, although the upper flipper on Eight Ball Deluxe wasn't working when we played it. The only other issue was the discrepancy between the volume of certain games, with Doctor Who and Kiss drowning out all the other games. 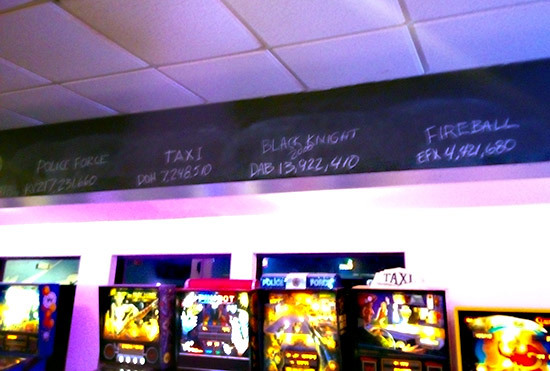 If you manage to get the highest score, you can have your achievement recorded in chalk above the machine in question. 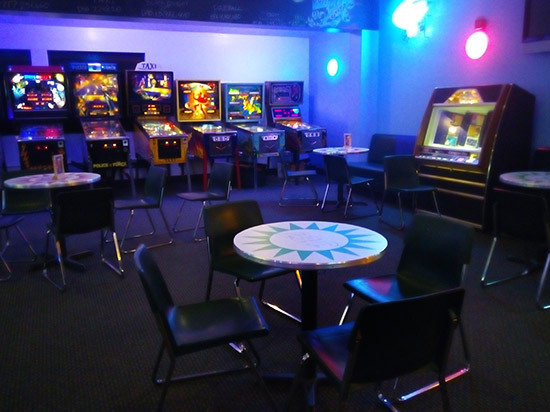 In addition to the machines, there's been a lot of effort put into The Pinball Lounge to make it a clean, modern and attractive environment, with colour-changing LED lighting and plenty of seating. 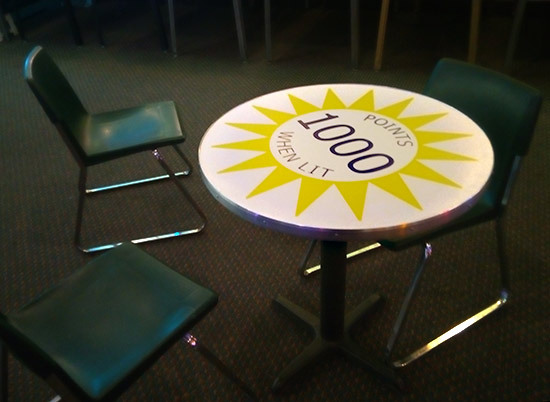 Even the bistro-style tables feature pinball designs. 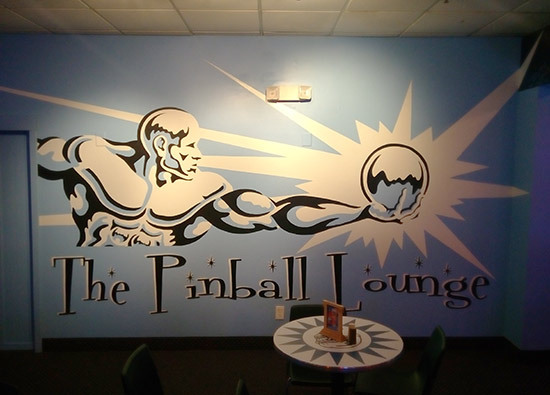 However, the most striking pinball design is reserved for the back wall of the Lounge. What kind of a lounge would it be, though, without a bar and some music. Thankfully, The Pinball Lounge has both covered. 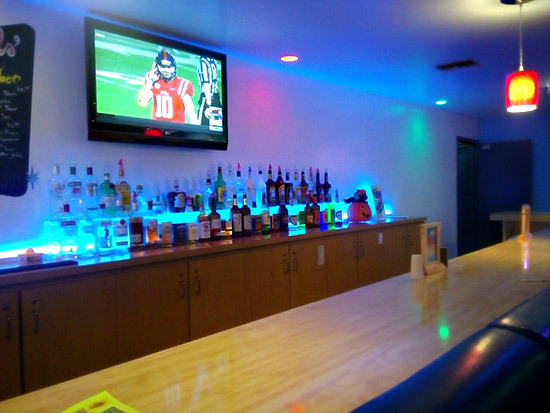 There's also an extensive food menu, based around pizzas, burgers, hot dogs, sandwiches, salads, wings, fries, and assorted breakfast items such as toast, ham, sausages and eggs. 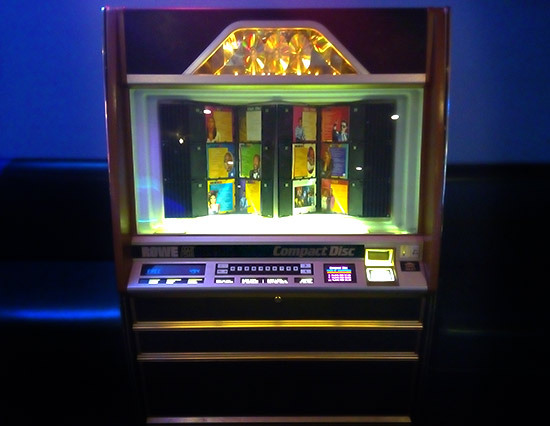 For music there is a compact disc jukebox, and although it says tracks are priced at a modest 25c each, it is actually better than that and set on free play. 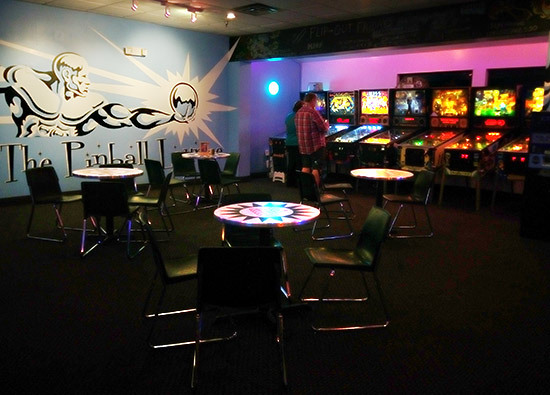 The only concern we had about The Pinball Lounge was the lack of people. Maybe it's the slightly remote location, but we were there at 7pm on Saturday and for a while we were the only guests. Three more players did turn up during the couple of hours we remained, but you might expect Saturday evening to be one of their busier times. 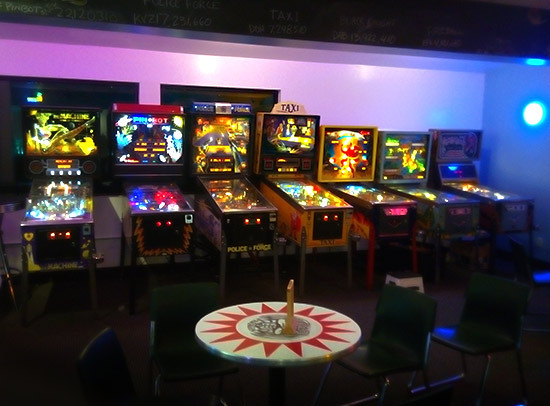 Hopefully word will spread and The Pinball Lounge will get the support it deserves, as it has a nice selection of machines in an attractive environment. 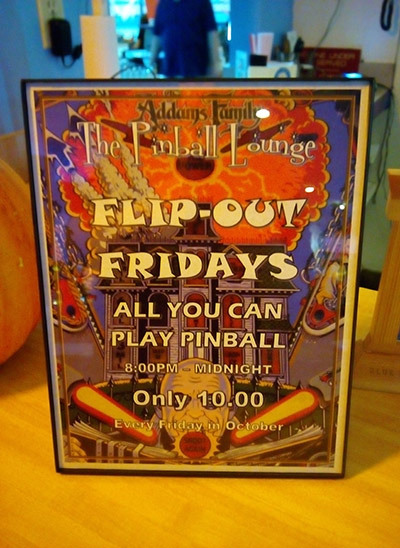 As an added incentive, on Fridays in October you can play all evening for just $10. Oviedo is about 15 miles northeast of Orlando, and the Bowling Center is just east of the town centre on East Broadway Street. 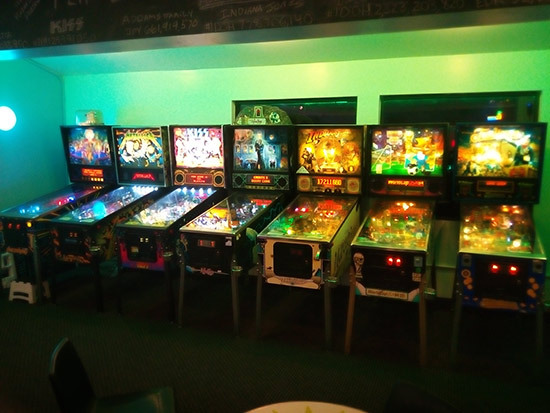 The Pinball Lounge is open from midday until 11pm Sunday to Wednesday, and stays open an hour later on Thursday, Friday and Saturday.